Marcus Ryu, a self-described Silicon Valley entrepreneur who created, with others, a company now worth $5 billion on the New York Stock Exchange, argues in today's Op-Ed section of the New York Times that "Tax Cuts Won't Create Jobs", NY Times (Oct. 9, 2017), at A23 (the title in the digital edition is different from the print title: Why Corporate Tax Cuts Won't Create Jobs). He is right. The tax cuts proposed in the framework set out by the Trump administration and Republican leaders in Congress claims to be pursuing economic growth that will benefit ordinary people (Trump's purported base). These claims are based in part on claims that U.S. taxpayers (individual, corporate and individual who owns businesses through partnerships) are much more heavily taxed than taxpayers in other advanced countries. Trump often points to the statutory tax rate for corporations (35%), which is higher than the statutory rate in most other advanced countries. But Trump usually ignores the fact that the vast majority of corporations (including very profitable U.S. multinationals) pay no or much lower taxes, in part because of the many loopholes and deductions that reduce the income that is taxed. When one considers the nation's GDP and the percentage of GDP paid in taxes, it is quite clear that the U.S. is actually one of the lowest taxed of developed countries, which often have income taxes, corproate income taxes and value-added taxes (which the U.S. does not have), as well as specialty taxes such as financial transaction taxes (which the U.S. does not have). See, e.g., Business Insider, Is the U.S. the highest taxed country? (Sept. 6, 2017). Trump has claimed that the proposed cuts in the Trump tax-cut "reform" framework don't benefit the wealthy and don't benefit him but are for the middle class and those with less wealth and income. The only way that claim would work would be if tax cuts that are clearly targeted at the rich (elimination of the estate tax, elimination of the AMT, drastic cut in the rate at which wealthy partners pay taxes on partnership income shares, drastic cut in the corporate tax rate when most of the benefit of tax cuts to corporations is used to pay dividends or do share buybacks for the wealthy managers and shareholders) had such a dramatic impact on overall economic growth and on sharing of the benefit of the tax cuts with ordinary workers that it made up for the fact that almost all of the benefit goes directly to the very wealthy and almost all of the negative impact (via additional borrowing and deficits) will result in fewer benefits from the poor. That positive balance is so unlikely from these tax-cuts-for-the-rich that they appear to be just another of the many Trump lies intended to mislead the American people. See, e.g., Business Insider, Trump tax reform plan just got its first brutal review showing how it would benefit the rich and almost no one else (Sept. 2017) (noting that "Americans among the top 1% of earners would see the bulk of the plan's benefits, while lower- and middle-class Americans — even most upper-class people — would see few benefits," citing the Tax Policy Center's study of the framework). Marcus Rye sets out a number of key ideas in his op-ed. First, "lower tax rates will not motivate more people to start companies." That is because most people who start a company do so because they have an idea, they want to strike out on their own, or they are ambitious for fame and fortune generally. Research on the 1986 significant changes to marginal tax rates shows that those changes did not induce higher-income people to work longer hours. Second, existing companies won't shy away from a promising investment because of the tax rate on potential gain. Company leaders are motivated to expand if possible, and "lowering the corporate tax rate isn't going to make us create jobs any faster." Third, tax cuts just "increase our post-tax profitability, which effectively transfers money from the federal government to our shareholders." The result is a bump in the share prices but no long-term impact on operations or employment plans. It doesn't even make it easier to raise cash for expansion, since companies are having no trouble getting capital now because of low interest rates. Fourth, the tax-cut proposal demonstrates shoddy business reasoning. It "wish[es] away huge tax-revenue shortfalls with stupendous growth projections." No well-run business would do that kind of shoddy planning. Fifth, "by 2027, when [the tax cuts] are fully phased in, four out of every five dollars ... will flow to the top 1 percent, an egregious wealth transfer to those who least need it." Finally, "tax cuts that deepen our already severe inequality in income and wealth are not in the long-term interests of any citizens, not even the very wealthy. Extreme inequality is corroding our civil society, poisoning our politics, and undermining our effectiveness as a nation. This is an extremely hard problem to solve, but when you're in a deep ditch, the first thing to do is to stop digging." Right Wing Propaganda Tank IPI Likes the Trump Tax-Cuts-for-the-Rich "framework"
There's no surprise here. The Institute for Policy Innovation (IPI) is a right-wing "think" (i.e., propaganda) tank that has consistently argued for tax policies that favor multinational corporations and the wealthy. So IPI has a posting on Sept 29 that is supportive of the so-called "tax reform framework" put out by the Trump administration. permitting immediate expensing for five years of equipment and similar expenditures by businesses (another provision that will allow mega corporations to make even more profits that can be shared--through bonuses, higher salaries, and share buybacks with the wealthy managers and shareholders of the enterprise and a provision that runs explicitly counter to the actual economics of the business, in which new equipment stays at close to original value in the early years with wear and tear actually economically backloaded onto the last years of the useful life). Meanwhile, the rate of taxation on the lowest income group in the country, the bottom percentile, would be increased by 20% (from a 10% rate to a 12% rate)--a truly significant and revealing increase for people who are struggling to make ends meet in an "as needed" worker environment where steady full-time jobs for a regular paycheck are vanishing as corporations call workers in when they want them and send them home sometimes after only a few hours. (This is of course accompanied by a continuing right-wing assault on worker rights and the attempt to shrink labor's power and ability to negotiate with extraordinarily powerful employers in unison rather than individually.) While the standard deduction (and possibly child care credits) will be increased, the personal exemptions will be eliminated, as well as perhaps other deductions that sometimes stave off disaster, such as the medical expense deduction. This means that many of the low to lower-middle income families with children will pay the much higher rate of tax on a larger portion of their income--i.e., their taxes will increase. For the rest of the lower income and middle income classes, tax relief will be minimal--a few hundred to a thousand dollars, most likely. Note that the members of the Republican Party establishment who are pushing this framework have in the past said that they were very concerned about deficits. Their concern about deficits was the purported reason for limiting the infrastructure plan to jumpstart growth after the Great Recession. Their concern about deficits was the purported reason for nearly shutting the government down time after time over the decision to raise the debt limit for payment of debt obligations the United States government had already incurred. Their concern over deficits was a purported reason for wanting to "reform" Medicaid, Medicare and Social Security--the programs that exist to help the most vulnerable Americans. But now those same Republican Party establishment figures are saying they don't care at all about the deficits. They are willing to allow the deficit to mushroom in order to give yet another gigantic tax cut to the very wealthy. The budget resolution put forward by the Senate Budget Committee would allow a $1.5 trillion tax cut over 10 years, but this plan is likely to cost between $3 trillion and $7 trillion (or more). (Note that the $1.5 trillion figure already includes gimmicky thinking--instead of using the actual law as the baseline, the GOPers are assuming a baseline that assumes that expiring tax cuts don't expire, which gives them more room for additional cuts than if they had to account for actually extending those tax cuts too. So much for McConnell's pledge that any tax reform would have to be revenue neutral. See Tentative U.S. Budget-Tax Deal Gets Nod from Two Republicans, Bloomberg (Sept. 19, 2017). Republicans, as usual, claim dynamic scoring will work, because it will show that growth will make up for lost revenue. Toomey, a Pennsylvania Republican tax cut ideologue, claimed that tax-cut induced growth would actually reduce the federal deficit, and Wisconsin Senator Johnson agreed (especially with the aid of "dynamic scoring", maybe done outside the CBO). Id. Sadly, that is not supportable. This is utter hypocrisy. And while Trump and various functionaries in his administration have explicitly said that their tax "reform" framework is meant to aid the middle class and not give a bunch of tax cuts to the wealthy, there's no evidence in support of that statement. Their program aids the wealthy and ignores or harms the middle class and poor. See, e.g., Trump Says His Tax Plan Won't Benefit the Rich--He's Exactly Wrong, The Atlantic.com (Sep. 29, 2017); Trump Proposes the Most Sweeping Tax Overhaul in Decades, NY Times (Sept. 27, 2017) (noting that Trump described the overhaul as "an economic imperative" for whom "the biggest winners will be the everyday American workers as jobs start pouring into our country, as companies start competing for American labor and as wages start going up at levels that you haven't seen in many years" though there was scant detail on how working people would benefit from "a proposal that has explicit and substantial rewards for wealthy people and corporations"). Trump explicitly said in his Indianapolis speech that wealthy people like him would not benefit (see New YOrk Times article, cited above). And Mnunchin said the same thing months ago ("no absolute tax cut for the upper class"). See Trumps Tax Plan: Prioritize Cuts for the Rich. That statement is simply not true, since the estate tax, the AMT and the reduction of taxes on pass-through income and on corporate income would each directly benefit the Trump family. He also said the framework would "protect low-income and middle income households, not the wealthy and connected". See New York Times article on Indianapolis speech, above. Again, that statement is simply not true: it will provide huge tax breaks for the wealthy and connected and minimal tax breaks or even tax increases for the low and middle income households. And Steve Mnunchin effectively admitted that the plan will result in tax breaks for the rich, essentially by disingenuously claiming that you can't do a tax cut aimed at the middle class without also giving something to the rich. See, e.g., Eric Levitz, Trumps Tax Plan: Prioritize Cuts for the Rich, Say He Isn't, Daily Intelligencer, New York Mag.com (Sept. 27, 2017); Can't guarantee tax cut for entire middle class: Mnuchin, Reuters.com (Oct. 1, 2017) and by saying that the statement that there would be no tax cut for the rich "was never a promise. It was never a pledge...It was [just] what the president's objective was". Trumps Tax Plan, NYMag.com (Sept 27, 2017). And of course, Gary Cohn, similarly has refused to guarantee that no middle-class family would face a tax increase. See Cohn, Mnuchin Draw Line on Corporate Rate, Tease Debt Reduction, Tax Analysts.org (Sept. 29, 2017) (Mnunchin claiming $2 trillion of growth with a claim that the tax cuts would cause a 2.9 percent GDP growth rate over the decade and a cut in the deficit; Cohn claiming enough growth to pay for the entire tax cut). Note that one of the gimmicks that Mnunchin used to avoid the real effect was to separate the estate tax from the regular income tax cuts--so they admit that they are benefitting the wealthy with the estate and AMT taxes, and then claim they are not with the income taxes. In fact, the income tax cuts also are beneficial for the wealthy. do not eliminate the estate tax--it only taxes the very wealthiest of the wealthy, so it can only benefit the very wealthiest of the wealthy. The claim that eliminating the estate tax "saves" small businesses and family farms has been debunked time after time. do not eliminate the AMT--it only taxes the top quintiles of the income distribution. 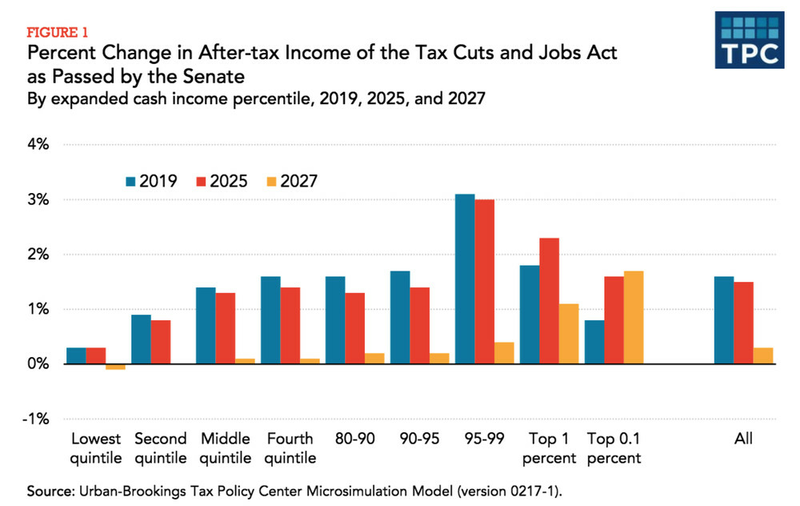 If you want to save the affluent rather than the real middle class, you can structure the AMT to hit only the top quintile. do not increase the bottom rate paid by the low-income Americans from 10% to 12%--that only hurts those taxpayers. do not eliminate the highest tax rates (the investment income tax, etc.) Consider adding a financial transaction tax. eliminate the "carried interest" provision that allows wealthy managers of joint ventures to enjoy capital gains instead of ordinary income rates on their compensation along with, often deferral of any income inclusions. eliminate the section 1031 like-kind exchange provision, that benefits real estate professionals like the Trump clan with near permanent deferral of income. As Ron Wydon put it "if this [Trump/GOP] framework is all about the middle class, then Trump Tower is middle-class housing. It violates Trump's tax pledge that the rich would not gain at all under his plan by offering sweetheart deals for powerful C.E.O.s, giveaways for campaign coffers, and a new way to cheat taxes for Mar-a-Lago's loyal members." Id. In other words, saying it is for the middle class is a whopping fairy tale. And of course, it doesn't provide any particulars about the nitty gritty issues that would have to be addressed, like preventing abuse of the 25% pass-through rate, limiting the deductibility of interest expense, or phasing out the expensing write-off after 5 years. Anyone with any understanding of the history of tax provisions knows that lobbyists will start immediately with demands for 1 or 2 year extensions to the expensing elimination, and as soon as the public's awareness of the issue has ebbed, Congress will cave and make it permanent. IPI likes the plan, nonetheless, because most of the things that IPI claims are "pro-growth" tax policies are actually "pro-wealthy" tax policies that have almost no evidence in support of helping to spur greater growth. IPI specifically mentions expensing (highly profitable for large corporations, since smaller companies can already expense most new investments); the move to territoriality (favors multinational corporations that have moved their key IP abroad); the elimination of the AMT (favors the wealthy); the elimination of the estate tax (favors the ultra wealthy); and the reduction of corporate tax rates from a statutory 35% rate (paid by almost no corporation) to a statutory 20% rate (lower than the statutory rate of our so-called "competitor" nations, that also have a VAT, which the US does not have). There is no real evidence that any of these tax changes will spur economic growth, and Congress has never funded the research that would be necessary to show that they do or don't. It has depended on little more than Arthur Laffer's napkin drawn curve (not based in empirical evidence) and general Chicago School "free marketarian" and "trickle-down" theories. Oh, and gimmicks like using "dynamic scoring" that assumes a large rate of growth to justify tax cuts that otherwise clearly create huge deficits. Kansas's experiment in slashing taxes for businesses and wealthy was supposed to prove that cutting taxes was a great way to engender growth. It proved exactly the opposite. Reagan's 1981 tax cut was supposed to prove that big tax cuts cause huge economic growth--instead, deficits mushroomed and every other year of his term there were tax increases of one kind or another--mostly hitting little guys and not the wealthy. Similarly, Bush 2 cut taxes and saw a surplus turn to a deficit, and ended his term with a Great Recession because of a speculative boom fueled by loose money in banks and financial businesses. In contrast, there is real evidence that public expenditures to improve infrastructure, protect the environment, support basic research not funded by corporations, and fund educational opportunities have real positive impacts on economic growth that is beneficial for the entire society. Let's call a spade a spade. This plan for so-called tax "reform" is really just a smokescreen for shrinking government and making it even harder to protect the environment, enforce the laws, make polluters stop polluting, protect the vulnerable and do the other things that the people acting together through government can do but that the people each acting individually simply cannot do. Like Trump's typical lies (about how "great" his response to the Puerto Rican devastation has been, when he waited days to act, sent much fewer military personnel much later and otherwise treated Puerto Ricans like unimportant Americans compared to the way he treated Texas and Florida), the tax "reform" framework is a lie. It is a boon for the rich, a boondoggle for the poor and middle class, and a bad joke for the future economic growth of the country. In an extraordinarily frank breakfast exchange with journalists, Bernie Sanders answered a number of questions about his views and the direction he thinks the country needs to move. As usual, the press tended to ask "horse-race" questions rather than substantive ones. But Sanders responded with substantive answers, not the "gotcha" answers (about other candidates) that journalists' questions encourage (and that many politicians seem quite satisfied to work into their press encounters). Having indicated that he thought it was time the US made some progress towards meeting the needs of ordinary working Americans, such as universal single-payer health care along the lines of our current Medicare program for seniors, and maternity/paternity and medical leaves for ordinary wage-earners, Sanders was asked if he would pay for those benefits, at least in part, with higher taxes. He answered forthrightly that taxes would need to be increased, especially for the extraordinarily wealthy and corporations. He noted the immense inequality that ordinary Americans face today, an inequality that steals away opportunities and makes daily life a hard grind for so many people. Just twelve (12) of the richest Americans saw an increase in their wealth over the last two years of a whopping $154 billion--that's more than the entire wealth of a majority of Americans. Corporations offshore their assets and avoid taxes with "rent" profits accruing to them while, again, ordinary Americans don't even get decent living wages. Hedge and equity fund managers who benefit from the "carried interest" loophole generally pay a lower rate of taxes than truck drivers. See, e.g., Sanders' website post on how the richest .0001% pay their taxes. These privileged elites need to be asked to step up to the plate and pay their fair share to support necessary programs. As to specifics of how those taxes should be increased, Sanders noted that he hoped to release a tax reform proposal soon. It would include, he said, a transaction tax on Wall Street business, an end to multinational corporations' ability to avoid taxes through moving business into tax havens, and a more progressive income tax (see, e.g., this post on his website). I will add here that these are many of the reforms that this blog has argued for over the years. Clearly, the right-dominated tax cut regimen of the Reagan years, the Gingrich Contract on America, the absurd Grover Norquist "never a tax increase" pledge, and the numerous revenue reduction acts passed in the Bush I and Bush II years--and of the Republican-dominated Congress and state houses during Obama's presidency--has been one of cutting taxes for the rich and big business and increasing them (if finally deemed necessary to increase revenues after cutting spending past the bone) on working people through regressive payroll, sales and excise taxes. It is time for us to return to a truly progressive tax system that asks as much of the rich as it does of the working poor. Watching the hour-long exchange is well worth your time. It is also surprisingly refreshing to see a politician respond carefully and thoughtfully with forthright answers that do not pander to billionaire interests or Wall Street. You can click on the video below.